As was touched upon in the Be Aware article, there are certain factors or attributes which are known to increase a cat’s risk for developing a urethral obstruction. An expanded list of these risk factors is presented again here, as they are important to consider when developing a plan to decrease your cat’s risk of developing this awful condition. 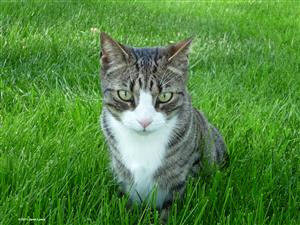 Male cats are at higher risk than female cats. Overweight cats are at greater risk than cats of good body condition. Cats that eat only (or even predominantly) dry food are at greater risk than those that eat exclusively (or predominantly) wet food. Cats that have previously had a urethral obstruction are at increased risk of obstruction. Cats with recurrent bouts of bladder inflammation (‘cystitis’) are at increased risk of developing a urethral obstruction. Cats with a chronic history of mineral crystals in their urine (‘crystaluria’) are at increased risk of a urethral obstruction. Cats are at increased risk of urethral obstruction during times of stress in their life. As you may have begun to appreciate from the list above, there are multiple risk factors which you can affect to have some influence over your particular cat’s risk for developing a urethral obstruction. What’s more is that some of the changes you make can have a more far-reaching influence by affecting multiple risk factors. So, while its not possible to guarantee that you’ll never have to deal with a case of urethral obstruction by making the changes I’ll be recommending below, I can certainly say that such changes will greatly decrease the likelihood of your cat ‘blocking’. And honestly, with as debilitating, frustrating, expensive, and potentially fatal as this condition can be… every little bit of prevention really does help! This is a common phrase in many disciplines, and while it probably isn’t the best attitude to take when dealing with the health of our oceans and environment, it certainly is a great rule to live by when it comes to the health of your cat’s urinary system! In this case, the ‘pollutants’ are both the minerals within your cat’s urine and any ‘inflammatory mediators’ that may be present as well. As previously discussed, minerals within the urine can coalesce to form crystals, grit, and stones, any of which can lead to a urethral obstruction. As for the inflammatory mediators… they can lead to bladder wall inflammation (cystitis), which itself is another of the risk factors for urethral obstruction. The more water (moisture) going into your cat, the less concentrated their urine will be (both with minerals and inflammatory mediators) and the more regularly they will urinate and flush out their bladder. This way, even if minerals coalesce to form stones, it won’t matter because they won’t be in your cat when they do! As you should now be realizing, by improving your cat’s hydration (or at least preventing their dehydration), you can decrease their risk for urethral obstruction. Have multiple water dishes available throughout the house: The easier it is for your cats to get to clean, fresh drinking water, the more likely they are to drink it. Having water bowls in multiple rooms of the house and on several different levels (if applicable) is a great way to help ensure easy access. Its also a good idea to have bowls of different material (metal, glass, ceramic, etc. ), depths, widths, and shapes when possible. Cats are called ‘finicky’ for a reason, and again… its all about making it easy and attractive for them to drink water. Use a water re-circulator (kitty water fountain): These can be particularly effective for cats that like to drink from faucets or bathtubs. Their biggest ‘knock’ is that some cats like to play in them, and a watery mess can ensue. But such a mess is far easier (and more pleasant) to clean up than the ‘mess’ that urethral obstruction can be. Flavor your cat’s water: This can be a great way to encourage more water intake in your cats. You can use some low sodium chicken or beef broth (see note below), but probably the most enticing additive is the water from a can of tuna. A simple way to get the most out of the water from a can of tuna is to dilute it with more water, then fill an ice cube tray with the mixture and freeze. (Be sure to label this tray though… few people will want a tuna flavored ice cube in their own drink.) Drop one of these ice cubes in your cat’s water dish at each change and voila… tuna-flavored water! Here's a whole article of tips, tricks, and products to help you get your cat to drink more water. It also helps you figure out just how much water your cat should be drinking. Stress can be a major contributor to the development of feline urethral obstruction (and a host of other feline medical problems as well). Such stress can come from a change in the weather (cases of urethral obstruction seem to increase in frequency during cold snaps), a new addition to the family (human or otherwise), change in household dynamic (holiday visitors, family traveling, home remodel, and others), or poor litter box management - just to name a few. In many cases, you can take simple steps to minimize your cat’s stress and therefore decrease their risks for developing a urethral obstruction. Practice good litter box maintenance: The general ‘rule of thumb’ in the veterinary world is to have one more litter box than the number of cats you have (i.e., 3 boxes for 2 cats, and so on). Having the boxes in different rooms, on different levels of the house, and away from high-traffic areas of the home can help too. The frequency with which you will need to scoop and clean the boxes will depend on how fastidious your cats are, but its best to err on the side of caution and scoop daily, and do a full clean regularly. The type of box and litter can have an impact as well, with most cats preferring large, uncovered litter boxes and unscented litters—but every cat is different, so try out several to determine your cat’s preferences. This small investment in time can yield significant benefits. Here's everything you need to know about litter boxes and cats - including how to choose the best litter and litter boxes, how many litter boxes you need depending on how many cats you've got, and how and where to best do your cat's litter box set up. Cats are NOT party animals: Most cats really don’t like changes in their daily routine, and few things change up that routine quite like the holidays and overnight visitors. When the holidays come, be sure to provide your cats with their own ‘safe room’, complete with a clean litter box (or two), fresh water and food, and some comfy bedding. Keep this room off limits to visitors and your cats will likely weather the holiday storm much better — as will your guests’ coats and other belongings! The ‘safe room’ is something that some cats may need all year through, and many will also need it when introducing a new pet or baby to the family, or when renovations disturb the house. Don’t forget play time: Though some cats might not seek out play time with you, many would eagerly jump at the chance if offered and it can be a great way to decrease stress—their’s and yours! From laser toys and The Cat Dancer to catnip mice and puzzle toys, cat play isn’t as difficult as you might initially think. And since play time will also help with your cat’s weight control, it has a ‘double benefit’ when it comes to preventing urethral obstructions. Simple petting and occasional brushing can help to decrease their stress as well. The power of pheromones: Pheromones are compounds that animals naturally secrete to elicit a certain type of response from another member of their species. In the case of cats, calming and anti-anxiety pheromones have been isolated and synthetically reproduced and are available in a product called Comfort Zone (with Feliway). It comes in both spray form and as a plug-in diffuser. It can go a long way towards decreasing stress and anxiety in cats when used appropriately. Such pheromones can also be helpful when introducing new cats or when trying to decrease in-fighting amongst cats within the same household. Let them have a sleep over: It's not uncommon for cats to get into a whole heap of medical trouble when their owners are away on vacation. In many of these cases, such as with urethral obstruction, these medical problems can turn quickly fatal if not detected and appropriately treated in time. Though many people consider cats ‘low maintenance’ pets that can be left on their own for a long weekend, its really not the best approach. The best bet is to hire a knowledgable, responsible, and capable pet sitter to stay at your house and watch after your animal brood while you’re away on vacation. If you don’t already know of one, speak with the reception staff or nursing staff at your veterinarian’s office… many of them will often do pet sitting on the side, and if they don’t do it themselves, they’ll likely be able to recommend you to someone who does. When it comes to feline urinary problems, including urethral obstruction, what you’re not seeing can truly lead to your cat’s death. Be sure to monitor your cat’s eliminations daily. Note changes in volume and frequency, the occurrence of straining or vocalizing, or the presence of blood. If you are noticing any persistent changes, bring them to your veterinarian for evaluation. Earlier diagnosis and care will not only decrease your cat’s pain and suffering, but it will often save you money (in the long run) too. Well, this brings us to the end of this blog series on feline urethral obstruction. I hope you’ve picked up some useful information and tips about the prevention of this common, devastating, and frustrating cat emergency. If you have, I hope further that you’ll share it with your cat-owning friends and family to help them keep their cats safe too. The more this information gets around, the better off the cats and cat owners of the world will be. Also (and I promise this will be the last reminder)… if you’ve ever had any experience with feline urethral obstruction, I’d love to get your feedback on the experience. I created an online survey which takes only a few minutes to complete. I’ll post results for all to see. Again, thank you in advance for your time and for helping me help others.